Having spent several years observing shipping in the Mersey from a wonderful vantage point on the fourth floor of the Royal Liver Building, I have, over the years developed a fascination for merchant ships and the mysterious exotic destinations they plied their trade to, especially when the cargo was cotton, tea or coal. So reading recently about the prisoner of war camp at Grizedale Hall in the Lake District and its connection with the Brocklebank Company of Liverpool, I became intrigued to know more. What follows is a brief biography of Daniel Brocklebank (1741-1801), shipbuilder and mariner, his family and some background detail of the shipping line he founded. Daniel was born in Torpenhow, Cumberland and apprenticed to a Whitehaven shipbuilder at the age of fourteen. At the time Whitehaven was at the centre of an emerging shipbuilding industry on the west coast serving mainly the coal trade. He married Anne Cuppage in 1769 and at the age of 29 they emigrated to America with their daughter Sarah where he set up his own shipyard near Portland, Maine. Two sons were born there, Daniel Jnr in 1773 and Thomas in 1774. Between 1770 and 1775 he built five ships but when the American wars of independence began in 1775, being loyal to the English crown, he returned home to Whitehaven with his family in his most recently completed vessel, Castor. Daniel became a privateer, using Castor now armed with guns, later adding merchant ships Precedent and Cyrus to his fleet which traded to all parts of the world. Three further children were born after their return to England, Anne 1777, John 1779 and Margaret 1782. In 1785 he restarted shipbuilding in Whitehaven building nearly thirty vessels in total during his lifetime, and by 1795 his own fleet consisted of eleven vessels. Daniel Brocklebank died in 1801 and the company was renamed Thomas and John Brocklebank when his two remaining sons took over the business, older brother Daniel junior having died in 1790 aged 17 in Jamaica in command of the ship Alfred. 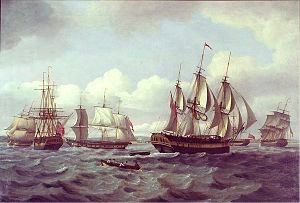 Despite the Napoleonic Wars (1803-1815) the company thrived and by 1809 Brocklebank ships were trading to South America, China and India. Thomas Brocklebank (1774-1845) moved to Liverpool in 1819, leaving brother John running the shipyard in Whitehaven and the ropery at Bransty. The firm opened an office in Rumford Street in 1822 and in 1827 Brocklebanks built their first paddle steamer, the Countess of Lonsdale.